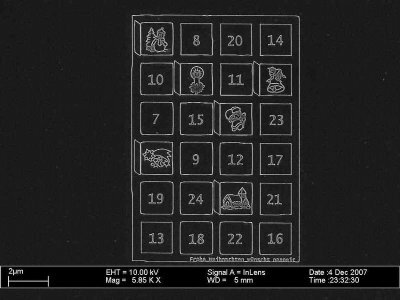 At 8.4 x 12.4 micrometers, the world's smallest advent calendar was created in a lab late one night in Germany. The motivation for the work was that the researchers wanted to have "a nice picture of Christmas to put on our homepage." "We waited until normal business was done for the day in the clean room," said PhD student Daniel Neumaier at the University of Regensburg, one of the three collaborators on the project. "Then we went in and did it. We were just having fun." He said the creation took about two hours. On the randomly-numbered calendar, the doors for the first six days of December are open, revealing six different images, including Santa Claus, a bell, a snowman and a church. 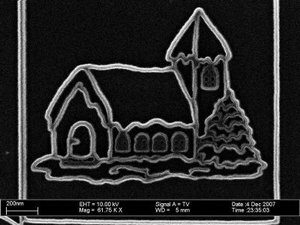 The smallest images on the calendar are the glass panes on the church windows, which measure about 20nm. At the bottom of the calendar, the researchers finished with a wish: "Merry Christmas wish from Nanonic" in German. It would take about 5 million of the calendars to fit on a postage stamp. Nanonic is the start-up company founded by the three doctoral students, which supplied the computer program that guided an electron microscope in this project. Using the electron microscope, the scientists etched a semiconducting wafer coated with a material called "Poly(methyl methacrylate)" (PMMA). By breaking the bonds of the PMMA, they etched the lines and images on underlying semiconductor. Later they improved the contrast with an ion beam. One of the collaborators, Dieter Weiss, thinks that the advent calendar is the smallest in the world, but explains that he doesn't know for sure. "I searched on Google and could find nothing smaller," he said. The researchers admit that other labs around the world could create similar nano-scale images, which are used primarily for scientific research, and not art. That is really cool! Now all you need is one just like this, but with chocolates.